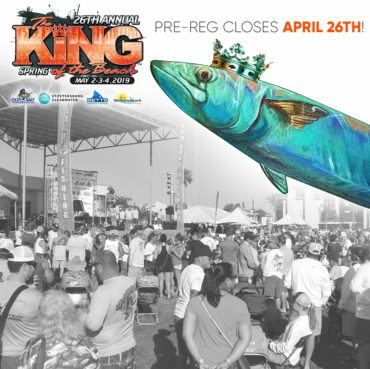 With King of The Beach King Mackerel Fishing Tournament around the corner, it seems only fitting to tailor this month article to Kingfishing in Tampa Bay. As of late, the Spring run of these Pelagics is in full force. Reports of jumbo Kings are coming in daily – in and around the bay. When it comes to Kingfishing in Tampa Bay, there are several areas to target and fishing techniques to be used. I’m certainly no expert Kingfish angler and this topic would be more like an encyclopedia volume, rather than an article to try to cover it all. However, I do know enough to be dangerous so I’ll share a few things that work for me and may bring you success in Tampa Bay. Let’s talk about a couple areas first and we’ll start where the greater abundance of fish is. The beach. From Holmes Beach to John’s Pass, there has been a lot of activity inside 7 miles. This is where you will find larger aggregations of migratory fish. Any shallow public or private wrecks, rock piles, and ledges are good areas to begin your search. There’s a lot of water to cover. Having a solid starting point is key, but don’t be afraid to burn some fuel looking for action. On the other hand, if you plan on fishing the bay you still have a shot and will save a few bucks on the fuel bill. All of the estuary’s deep flow points will attract big Kingfish. Bean Point (Passage Key Inlet), Southwest Channel, Egmont Channel, and Skyway Channel serve as the arteries to the bay. These areas act as the highway for bait and game fish moving and/or staging in the bay. Moving further up the bay, we have the Skyway Bridge. Hands down one of the local favorites for catching the Spring run of Kingfish. Traditionally, focusing on sections closer to the main shipping channel or deeper ends of the North and South fishing pier will yield better results. From there, we start to move into my wheelhouse. Inside the bridge – an area that will certainly hold less “smokers” but nothing to scratch off the list. Here you will want to focus on the main shipping channel. Closer to the bridge, from “A” to “B” cut is normally productive, but areas as far up as “G” and “F” cut have been known to hold monsters. 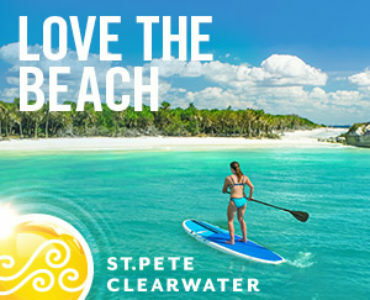 If you’re in the area, don’t forget to check the Port Manatee and Bahia Beach Reefs. Some of our biggest fish have come from these popular locations. Not matter where you plan to go or your adventure takes you, find and follow the bait. That’s what the fish are doing. Also, water temps around 70 deg seem to be the target. On the way, keep your eyes peeled for ANY bait or predator activity. Birds are the obvious, but one of my favorites is finding Spanish Mackerel. It’s almost a sure bet that a big King is lurking around.So, let’s cover a few ways to get them in the boat. For me, there are two basic techniques. Still fishing with live bait or trolling. Personally, I tend to lean more towards working an area on anchor using live bait. The larger the bait, the better. Having a few dozen hand-sized Pilchards, Threadfin Herring, Blue Runners, or Cigar Minnows will set you up just right. The kicker is having a livewell full of smaller baits (Pilchards or Cigar Minnows Preferred) to chum, if possible. Regardless of the bait, my go-to rig is a “stinger”. Whether you purchase them pre-made or make them your self – it’s a proven setup for catching Kingfish. There are several variations but when I make mine, they are 6-8” long of 40lb wire finished on each end with a simple haywire twist. The forward hook being a No. 2-3 live bait hook and the rear being a No. 4-6 treble. To rig it, the forward hook will be inserted through the bait’s nostril and the rear hook positioned in it’s back. One of the main reasons this rig is so effective is Kings are known for cutting baits in half and not getting a hook due to their aggressive nature. Using a rig like this will definitely increase your hook up ratio once a fish commits to your bait. From the “stinger” rig, we move up to the business end. This is usually 3-4 ft of 40-60lb fluorocarbon leader attached to 40lb braid. These days, I am using an 8 ft medium heavy – fast action Bull Bay Rod paired with an 8,000 – 10,000 series Shimano spinning reel. One of my favorite reels for “flat lining” for Kings is the Shimano Baitrunner. I have several. This gives you the ability to have 2 drag settings and quickly switch between them – by retrieving or manually flipping the trigger. Often times, fish are broken off when they strike the bait due to the intensity of the bite. The lighter drag setting of the Baitrunner can sometimes keep a fish on during the initial hook-up (Jump / Sky Rocket) before they turn on the after-burners and you can get into the main drag settings to fight the fish. More often than not, I like to “free line” my baits and I normally have them set back around 30 yds or so but sometimes adding a float to keep the baits suspended in the water column can make a difference. If I am chumming and I can visually see Kingfish feeding, we will pitch baits in those areas – often followed by a strike. 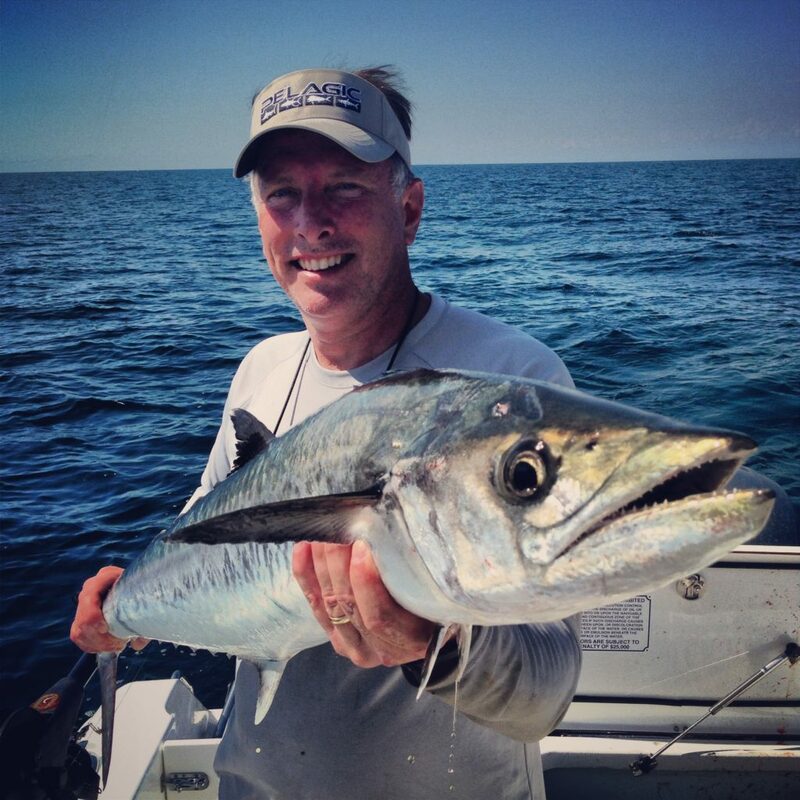 One thing you might notice is you start catching smaller Spanish Mackerel in your chum. That’s not always a bad thing, especially the further up in the bay. Keep setting your larger baits back further and further and keep the Spanish entertained on lighter tackle closer to the boat. It’s likely the big King will come around to see what all the commotion is about. If you are not a bait guy or can’t find the bite – cover ground. 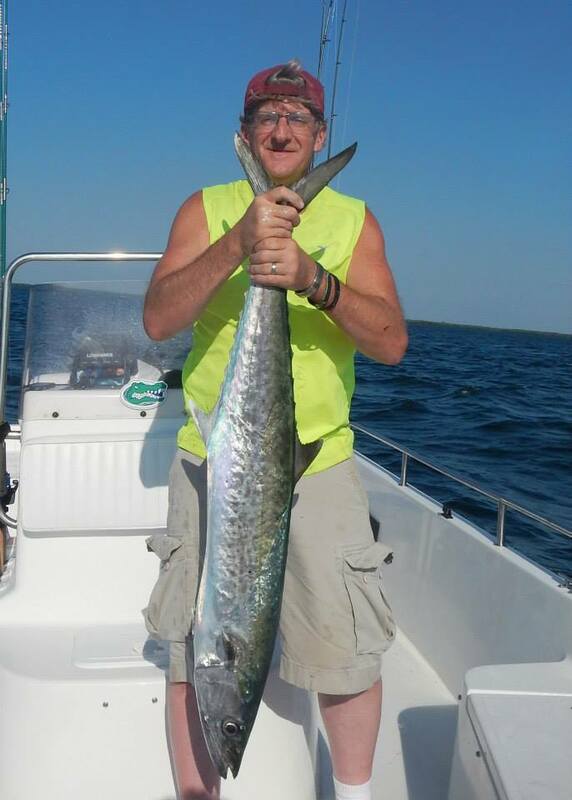 When you are kingfishing in Tampa Bay, trolling is an extremely popular and effective method for getting on the meat. It’s a perfect way to prospect an area or quickly get hooks to fish found on the run. There’s a host of methods and rigs to get it done (planers, down-riggers, slow trolling live baits…) but for me, I like trolling lipped plugs. With today’s technology, lure manufactures have come a long way and it is mind blowing what’s available on the market for trolling plug designs. One of my favorites is the Rapala X Rap 20 in the Mackerel pattern. I like running 2 rods and I use the equipment setup as the live bait with the exception of switching the leader to 60 lb and increasing the length to 6-8 ft. I’ve found that I am generally around 4-5 knots but that will vary depending on several factors (tide-current, direction, wind, waves…). Don’t be afraid to speed up a little, they will strike a fast-moving bait! Once you are hooked up, don’t stop! You can slow down a bit, but keep the boat in gear and moving to stay tight on the fish and potentially hook up on any other fish on your secondary rod. If you think you have the monster, go ahead and clear all your lines – but always keep a pitch bait handy. Finally, don’t forget your gaff! You have spent a lot of time preparing, hoping, and praying to catch the winner. Make sure the deck is clear to bring the toothy critter on board and take your time to get a good shot on the fish. This is especially important if you are not using wire. One wrong turn of the rod or the fish could end up with your trophy catch having the last laugh – and swimming away.